I will be the first to admit that having a large and expanding makeup collection is fun, but finding a place to store it all can be exhausting. 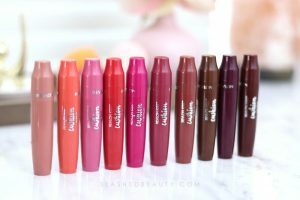 Products that are marketed specifically for makeup organization can be expensive… unless you want to order something from China and wait two months for it to arrive. Ain’t nobody got time for that! Besides my large drawer carts (which I got for 75% off on Cyber Monday), I mostly use common household items for makeup organization. 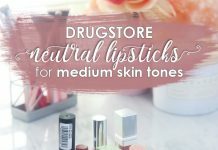 Hopefully, you already have some of these items around your home and can repurpose them to help organize and display your beauty products. I’ve gotten great use out of empty candle jars to store various things, but most of them go toward organizing my brush collection! I typically use the 4 oz Glade candles filled with decorative plant filler to help the brushes stand upright. When you’re at the very end of your candle, scoop out the remaining wax or pour it out while it’s melted. Turn the jar upside down and hold a match or lighter to the base of the wick to melt the glue holding it down. After about 10 seconds, you should be able to wiggle it off. Use some Goo Gone spray to wipe out the glue, and you’ve got yourself a functional brush holder! 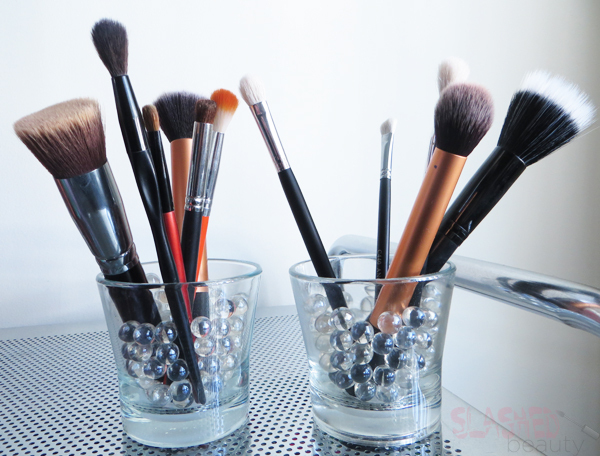 Jars come in all sorts of varieties, and are a visually appealing way to display various beauty and makeup items. 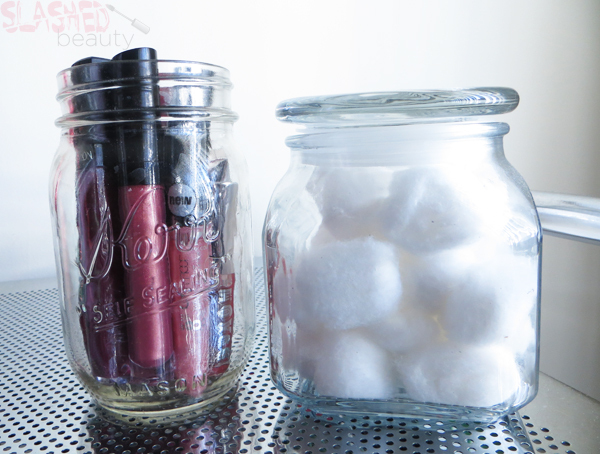 I use a mason jar to keep most of my lip glosses together, and what used to be a candy jar to keep my cotton balls in. You can buy jars new from the 99 cent store, or just wait til you finish up some jam! Ice trays are a great way to keep eyeshadows organized so that they’re not just sliding all over the place. 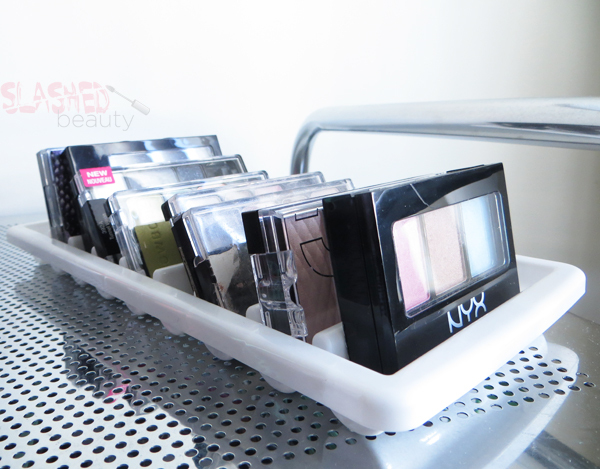 You can use the normal trays for eyeshadow singles, or an ice stick tray– like the one I have– to organize small palettes (perfect for Wet n Wild trios). 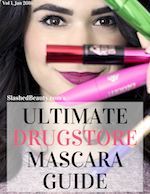 I got mine from the 99 cent store, but you can also find these inexpensively online and probably the drugstore. 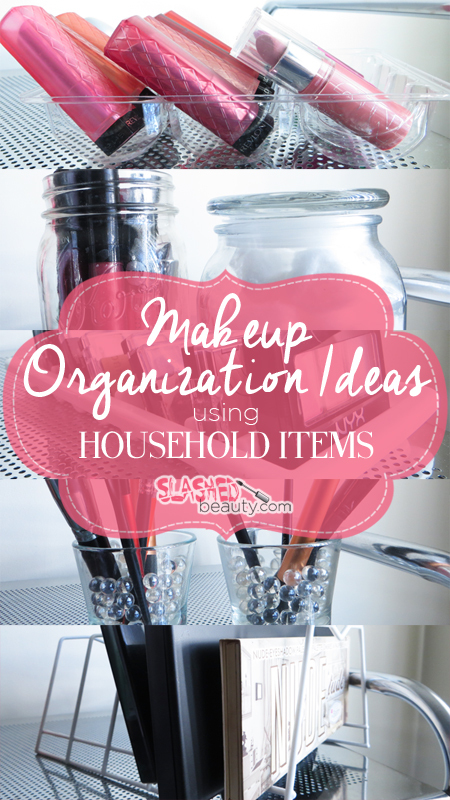 Have you repurposed any household items to organize your beauty products? Tell me about it! I use the Bath and Body Works 3 wick candle empty jars. I love the cookie tray idea!!! Genious!! What is the best way to get the remaining wax out of the bottom, i have been trying to find a good way! I’ll light the wick, let the candle liquify, then pour it out while it’s still hot! You can also try holding the lighter under the candle for a bit to warm it up– it might be just enough to melt what’s left! put the jar in the freezer for a couple hours then take a knife and just get on the side of candle and it will pop right out. works great! That’s an awesome tip, Leslie!! Thanks! I love how you organized everything. So genius. Those are great ideas ! I recently got an alex drawer because I don’t fit and continue to store stuff in my old cabinet as well. Cookie trays!!! That is brilliant!! Cute ideas! I actually use cookie jars for my cotton balls! good organization tips there, lady! WOW that ice cube tray idea is brilliant! I’m going to need to upgrade to a dresser very soon, I think! The cookie tray idea is GENIUS. I already use candles/jars to store brushes, pencils and other items I need to store upright. Great ideas! & kind of faux acrylic which is so in currently! Yes, more space is what I’m lacking too! Man, this is super nifty and creative! Wish I had thought of these ideas! The ice tray is nifty! Cookie trays! I never would’ve thought! Great ideas! 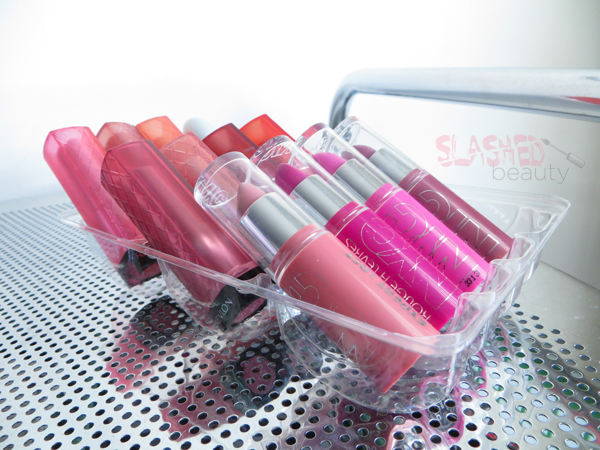 that cookie tray for lipsticks is genius! Legen-wait for it – dary! lol. Barney would surely give me a high five! Ice cube trays are an awesome idea! Never heard that one before, but now that I think of it they’d be great for rounding up all sorts of small stuff. Definitely! and you can get them in all sorts of fun colors. I like that you recycle products. Love the ideas! I have the same brush holder technique but I have bigger glass square vase thingies! Such a great idea to use ice trays! I have several short glass flower vases holding my makeup brushes, cotton balls, and q-tips on the bathroom counter, and a clear plastic office-drawer organizer from IKEA holding all of my makeup in a drawer – and another one holding all of my hair clips, headbands, and gels. I nabbed a plastic retail countertop display unit from my Dad’s warehouse to hold all of my jars, bottles, and boxes of beauty supplies inside a cabinet. 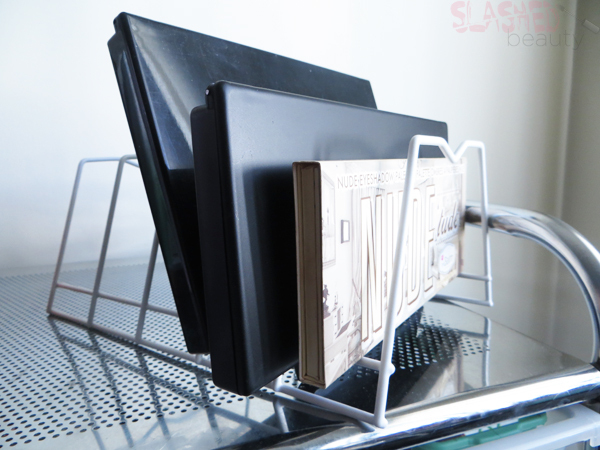 Re-purposing everyday items as decor is what my blog is all about – it also works for organizing & storage! lol! They’re for making ice that will fit into water bottles since most cubes won’t go through the spout!